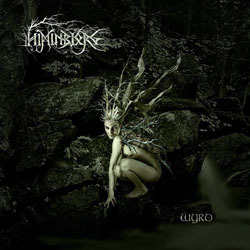 Himinbjorg are back with their latest full-length album entitled “Wyrd“. This cult French pagan black metal band was formed back in 1996 by Zahaah, the group’s main composer. They’ve been quite productive during their first years and released 5 full-length albums and an EP from 1998 to 2005, moving between folk pagan metal and pagan black metal. After a long silence, the band returned in 2010 with “Chants d’hier, Chants de Guerre, Chants de la Terre” a quite experimental album, released by their own label, European Tribes. 5 more years passed and a long period of touring, before Himinbjorg release their 7th full-length album “Wyrd” out on March 1st, 2015 via European Tribes in France and Vegvisir Distribution internationally. After the more experimental atmospheric approach of the previous album, I was quite curious to see where will this new album lead them. Well, “Wyrd” is a much more straightforward pagan black metal album than its predecessor. It is a return to the roots of Himinbjorg in terms of atmosphere and overall feeling and at the same time a step forward in terms of sound quality and production. Of course the band continues to experiment, offering once again a very versatile work! Himinbjorg have cooperated in this album with the famous Breton musician Christophe Morvan (Breizh pipe, Uillean pipe, flutes) and with the talented Gascon musician Baptiste Labenne (boha, mandolin, accordion), who both add a quality folk touch in the band’s sound. The album includes 9 compositions with a total duration of 48 minutes. The short intro with the sound of flowing water and the atmospheric bagpipes puts the listener in the right mood. The opening track “The Sword of Dignity” is a declaration of Himinbjorg’s sound. Epic melodic mid tempo pagan black metal with a wonderful combination of black metal screams and epic “ethnic” clean male vocals. Great song! The band has a very powerful sound, where guitars, bass, drums and acoustic instruments are all equally clear and very well balanced. The third song “The World of Men Without Virtue – The Circle of Disillusion” begins with a more aggressive and faster tempo, but it eventually becomes slower and more atmospheric and it finally concludes with a beautiful melodic guitar solo! The next song “The Circle of Warriors” is my favorite of the album, a wonderful epic black metal composition in the band’s unique style, which closes with a brilliant folk metal “solo” of bagpipes. “Initiation” is the fifth song of the album and once again its first half is more aggressive, followed by another unique folkloric pagan metal outburst in the second half. The next song is a mid-tempo dark black metal composition, based mostly on the repetition of atmospheric guitars and bagpipes and it’s suffocating screaming background vocals. It has a darker, almost haunting atmosphere, being a perfect match for its title “The Mirror of Suffering – The Circle of Ghosts“. The seventh song, entitled “The Shamanic Whisper” continues in the same mid-tempo dark pagan black metal style, with a somehow more epic atmosphere. “Another Shore” is a tranquil instrumental song with beautiful acoustic guitars and folkloric instruments. The album closes with “The Eternal Light“, which is a quite interesting song, somehow unusual for the band, something like a combination of epic heavy metal ballad with harsher vocals. Overall “Wyrd” is a great work, maybe the best and more complete album of Himinbjorg. I am pretty sure they will satisfy their older fans, but they will also gain new ones, thanks to the huge improvement of their sound and their continuous evolution. This time the band returns to the use of English for their epic lyrics, unlike the previous album where they sang in French. “Wyrd” is released in a jewel-case CD edition including a 12-page booklet with the wonderful artwork and layout by Vincent Fouquet for Above Chaos. It is distributed by the label European Tribes in France and by Vegvisir Distribution in the rest of the world. If you want to find more info about them and listen to their great music, you can visit their official pages following the links below.